Wooly Mammoth To Live Again? Japanese scientists seeking to clone prehistoric wooly mammoths were preparing their first frozen DNA samples Tuesday, in a bid to bring the beasts back to life. Remnants of what scientists think is from mammoth bone marrow, muscle and skin were unearthed last August in the Siberian tundra where they had been preserved in ice for thousands of years. 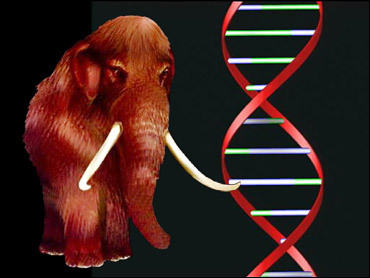 Researchers at the Gifu Science and Technology Center and Kinki University want to use the genetic material encased within the cells to clone a wooly mammoth, according to Akira Irytani, a scientist at Kinki University in western Japan. But first, they must determine whether the five specimens brought from Russia on Tuesday are really from mammoths. If so, they must then decide whether the DNA locked inside is well enough preserved for cloning to proceed. After that, it could take years to actually produce an animal. "There are many different problems to overcome," the Gifu Center's Hideyoshi Ichibashi said. "I think we can move ahead only one step at a time." Kinki University scientists, joined with veterinary experts from Kagoshima University in southern Japan, have searched for mammoth DNA samples since 1997 in Siberia. Kinki University's Irytani was hopeful about the DNA samples, estimated at 20,000 years old, saying they had been well preserved well below zero.